For many people, making a clock to drive hands on an exposed dial open to all weathers is a fascinating challenge. This movement is capable of driving a single exposed dial up to 2ft. in diameter. It is fitted with the dead beat escapement and the basic movement is hand wound, but automatic electric winding can be fitted and this is described in the text. Although the movement is larger than the usual project undertaken by the amateur clockmaker, the entire construction was carried out on the author's Myford ML 7 lathe. including the wheelcutting. The description also includes the construction of the leading-off and motion work together with suitable hands, Sources of supply for dials is also given. An additional chapter has now been added to this book. This deals with the construction of an electrically driven remote controlled dial. I have been asked for this on many occasions by constructors who want to drive a dial in a tower over their garage for example and yet want the movement in the house where they can see it. The remote dial is controlled from the mechanical clock. Other constructors have asked if striking can be added to this clock. The answer is yes. I saw an example of this recently. The electric striking unit in my book 'A modern tower clock installation', had been mounted behind the mechanical movement and connected with a short leading-off rod. 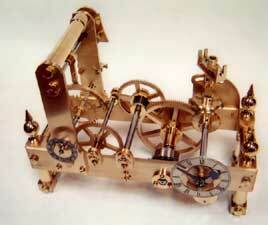 An alternative escapement is now offered, this is the Grasshopper escapement. A full description of its construction is included. There are 68 pages plus numerous drawings and photographs.